A2Z received an emergency response call from International Steel Group regarding a mercury spill in a pit at High Head #2 Pumping Station. An estimated 6 to 10 fluid ounces of mercury had spilled out of a broken flow gauge. A2Z sent their field chemist to survey the spill. 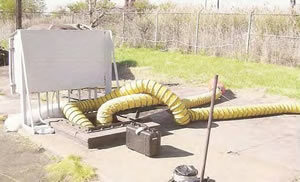 A crew was dispatched to begin cleanup using a Minuteman MRS-3 Mercury Vacuum. The levels of mercury vapor measured at the man way of the pit were so high that the confined space attendant had to wear a respirator in order to keep an eye on the entrant without being exposed to the vapors. 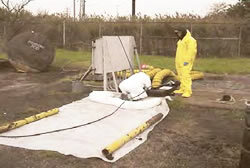 The pit entrant, wearing a level "B" (Supplied Fresh Air) suit vacuumed up all visible mercury from the floor and disposed of all loose debris and dirt from the pit. After a second and third vacuuming, mercury indicator powder was sprinkled onto the floor to find any traces. The space was ventilated throughout the day using two fans and ductwork in order to create air changeovers. After applying the indicator, the space was closed up and left to sit overnight. The crew returned to check the powder and vacuum up any mercury indicated. The mercury had been on the concrete floor long enough to corrode the surface and coat it. A wire brush was used to remove the coating and mercury amalgamator was used to gather any small beads created by this process. The space was again ventilated throughout the day. A level gauge was removed from the pit that contained several pounds of mercury. It was disassembled and disposed of. An additional 4 to 6 ounces of mercury were found in a sump. The sump contained several inches of water and sludge. A2Z used a shop-vac to vacuum up the water sludge. The mercury was left behind to be removed with the MRS-3 Mercury Vacuum. 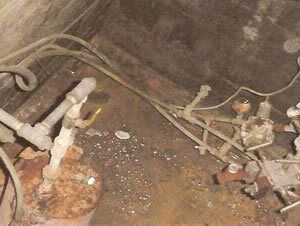 After the mercury was removed, the pit was still showing high levels of vapor. After ventilating the pit for 30 minutes new readings were taken. It was decided to install a venti-lation fan on the stove pipe. While the ventilation fan was on, levels were below the TWA (time weight average). ISG instructed workers that had to enter the pit to ventilate the pit for thirty minutes before entering. ISG decided to bring the controls above ground and stop entry altogether.